Subway is known for having several types of breads from which you can choose when ordering a sub. All the breads typically contain some form of wheat flour. The type of bread you select impacts the overall calorie content of the sub. 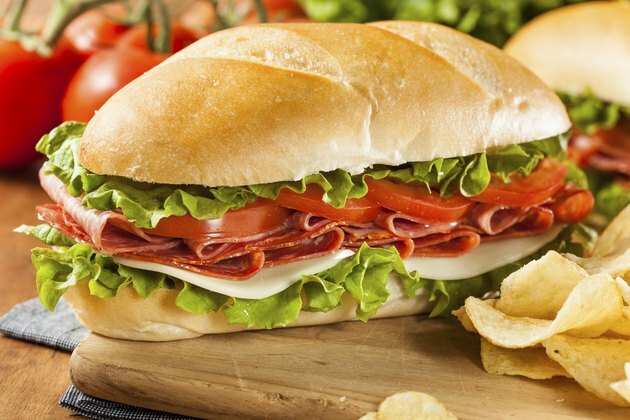 Subway has a variety of bread types for its 6-inch or 12-inch subs. There's 9-grain wheat, hearty Italian, honey oat, Italian white, Italian herb and cheese, Monterey cheddar, Parmesan-oregano, roasted garlic bread and flat bread. The specialty bread types such as the hearty Italian, Monterey cheddar, and roasted garlic bread may not be available at all Subway restaurants. One 6-inch serving of the 9-grain wheat bread has 210 calories. The Italian herb and cheese bread has 250 calories per 6-inch serving, while the hearty Italian, Parmesan-oregano and flat bread all have 220 calories for the same size serving. The Italian white has 200 calories per 6-inch serving. The honey oat bread has the most calories at 260 per 6-inch serving. The Monterey cheddar has 240 calories for a serving of the same size, while roasted garlic bread contributes 230 calories per serving. The lowest calorie value among the breads is the Italian white. This makes it the best choice for individuals who are calorie conscious; however, the honey oat and the 9-grain wheat have the most grams of fiber at 4 grams per serving. Diets high in fiber can help normalize bowel movements, lower blood cholesterol and help control blood sugar levels.